During the recent 2018 Community Connections Conference, the Minneapolis Promise Zone's current Equity and Inclusion Manger, Julianne Leerssen, conducted an “All About the Benjamins” presentation held at the Minneapolis Convention Center. She was joined by three panelists Jacob Akervik, (Minneapolis Promise Zone's Housing and Urban Development (HUD) Liason) Alysen Nesse, (Senior Resource Coordinator for Intergovernmental Relations) and Sadaf Rahmani (Community Representative for Congressman Keith Ellison). The purpose was to provide community members and organizations helpful information to increase their chances of being awarded federal grants. In total, there were 34 attendees and each expressed high interest to subscribe to the Minneapolis Promise Zone Newsletter which includes news, Promise Zone updates, and federal grant opportunities. Partner updates are also included in the newsletter; if you would like to have information included in our newsletter, please contact Communications Associate, Jenny Melin. 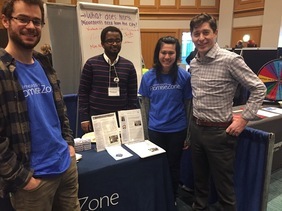 Each of the Minneapolis Promise Zone Americorps Volunteers in Service to America (VISTA) worked at the Community Connections Conference to inform community members about the ongoing projects happening in North Minneapolis. Mayor Jacob Frey stopped by to express his appreciation for the continued work of the Promise Zone in North Minneapolis. The Minneapolis Promise Zone has the unique advantage to be an initiative of the City, but located on the West Broadway Commercial Corridor, in the heart of North Minneapolis. Community members are able to access the City more easily to express what North Minneapolis needs from the City. At the Community Connections Conference, attendees were asked this very question. As a result, people answered that the City needs to address the following in North Minneapolis: violent crime reduction leading to an increase in economic development, more homes in addition to jobs, as well as more adults to help the children. Shauen Pearce, Mayor Frey's Economic Development & Inclusion Policy Director, came to talk with the Minneapolis Promise Zone's (MPZ) Economic Development Working Group (EDWG) on the 13th of February. Mayor Frey does not seek to reinvent the wheel, but rather grow the economy through inclusion by maximizing some of the current efforts underway. For example the City's Grow North Fund, a financial incentive package offered by the City of Minneapolis aimed at bringing jobs-intensive business investment to North Minneapolis, has been underutilized. According to Shauen and other members of the working group, many community members are simply unaware of these types of tools offered by the City. In order to improve these tools and create new ones, Shauen is assembling a council of small business owners to advisethe Chamber of Commerce, the City, and other business organizations. If you are interested in becoming a part of the small business council, e-mail Shauen Pearce. Alysen Nesse, Senior Resource Coordinator for Intergovernmental Relations, also came to present about Opportunity Zones, a new community development program established by Congress. Opportunity Zones allow governors to designate 25% eligible low-income census tracts (491 eligible census tracts in MN). Banks, foundations and Community Development Financial Institutions (CDFI) are incentivized by a temporary tax deferral to invest capital gains to fund specific projects in these zones through an "Opportunity Fund. However this is a private investment vehicle, so government wouldn't have control over who invests. Lack of restrictions for the Opportunity Fund could lead to investments that could potentially be harmful to the community instead of beneficial. 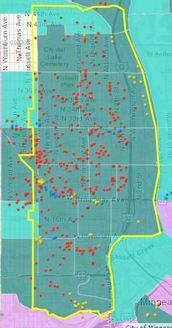 One way to mitigate lack of control over investment is to ask the Governor to nominate census tracts with a large number of City-owned properties. To see what property the city owns overlaid by eligible census tracts in the Minneapolis Promise Zone, click on the image to the left. To learn more about Governor's timeline click here. Economic Innovation Group is in the process of organizing a broad coalition of organizations working together to ensure successful implementation of the Opportunity Zones program. If you are interested in learning more or becoming a part of the coalition, please contact info@eig.org. If you would like to become a part of the Minneapolis Promise Zone Economic Development Working Group e-mail Economic Development Coordinator, Sam Calahan. The City of Minneapolis is currently accepting Requests for Proposal (RFP) for the Annual Litter Be Gone Event Management Services. The intent of the program is to assist communiteis and neighborhood-based organizations with community focused litter clean-up and measurement programs. The City of Minneapolis recently released the 2017 Joint Disparity Study to look at whether or not the Small and Underutilized Business Program encourages more contracts with minority- and women-owned small businesses. We encourage you to attend a listening session to give feedback about the report and the programs tonight at Sibley Recreation Center. Time: 6:00 p.m. - 7:30 p.m. The Governor's Housing Task Force and Working Groups have held meetings for the past two months. Community input is important for the task force to make the best recommendations to address the gaps in the system affecting housing stability and access to homeownernship and rental housing. Click here for directions on how to submit your idea(s) for review by the Task Force. Submissions will be accepted through March 15th and are encouraged sooner to provide ample time for Task Force consideration. Women Venture is offering an in-depth course designed with serious entrepreneurs in mind. It is a multi-session series that covers all of the critical components of creating and fine-tuning a business plan that will take you from launch to expansion and beyond. 1. Learn the key components to launching a successful business: creating an executive summary, legal compliance, marketing, finance, human resources, operations and sales. You must successfully complete Women Venture's Getting Ready course to be eligible to apply for Small Business Essentials enrollment. Once a bustling commercial hub, the area around the intersection of Penn and Plymouth Avenues in North Minneapolis had long been sparsely populated and sorely in need of revitalization. Then, in 2016, a new public-private development partnership set change in motion. While some parts of the $100-million project are still under construction, the redevelopment has already transformed the four-corner intersection, setting the stage for more business to move into the area in the future. Several partners are involved in the project, including Hennepin County, which invested $67 million to build a much-needed larger campus on the intersection’s northeast corner for its NorthPoint Health and Wellness facility, which offers medical care and other services. The West Broadway Farmers Market is excited to be entering our 8th market season, and celebrating the tremendous growth at the market welcoming 12,500 customers in the 2017 season! New Management: Appetite for Change will now manage the West Broadway Farmers Market. We are excited to continue our partnership with Freedom Square events in conjunction with the WBFM. We are also exploring ways to expand our Northside Fresh Bucks project, continue our "Big Dinner Party" community meals in partnership with YouthFarm and Cooking Matters nutrition and food skills courses at the market. None of this would be possible without YOU, our vendors! In addition to our traditional vendors offering prepared foods, we welcome local food trucks to join us this season. NorthPoint’s Community Food Shelf is participating in the state’s largest food drive, known as the Minnesota FoodShare March Campaign, and would love to have you participate with us. NorthPoint’s goal is to collect a combined total of 45,000 in pounds of food and cash during the Campaign. Please support our campaign and help us reach our goal by collecting and donating food and cash beginning February 26th through March 30th, 2018. All food donations can be dropped off at our Food Shelf in the lower level of our Human Services building Monday through Thursday 9am-3pm. Your tax-deductible cash donation can be sent to NorthPoint Food Shelf, 1315 Penn Ave. N. Minneapolis, MN. 55411 or you can make a secure online donation at www.northpointhealth.org. Cash donations are particularly important because it allows us to purchase items that aren’t usually donated, plus with our ability to purchase food in bulk at reduced prices we can multiply your dollar’s buying power – making one dollar stretch up to $5.00! Would you like to lead a food drive at your place of employment, at your place of worship or with your social group? We have promotional flyers and attractive collection barrels that we can provide and when your drive is completed, we’ll pick everything up. It’s that easy. Please contact Patrick Wilson for more information. Thu, March 8, 2-3 p.m. Wed, March 14, 6-8 p.m. Sat, March 18, 10:30 a.m. - 2:30 p.m. Wed, March 21, 6-7 p.m.
Mon, March 26, 11:30 a.m. - 1 p.m.
Tue, April 10, 4-5:30 p.m.
Thur, April 26, 9 a.m. - 3 p.m. If a discretionary funding opportunity indicates Promise Zone (PZ) preference points are available, please visit http://www.ci.minneapolis.mn.us/promisezone/WCMSP-190631 for additional information on forms and contacts to request preference point certification from the City of Minneapolis Promise Zone. Please submit your preference point request at least two weeks prior to the application deadline for Promise Zone certification approval consideration. If a funding opportunity does not indicate PZ preference points, you are still encouraged to contact the Promise Zone Manager, Julianne Leerssen (612-225-7721), about potential partnership opportunities to strengthen your application. Promise Zones are federally designated, high poverty communities where the federal government partners with local leaders to increase economic activity, improve educational opportunities, and leverage private investment. The Minneapolis Promise Zone (MPZ) plan is a comprehensive, community-driven revitalization strategy that builds on and aligns numerous initiatives to address the persistent unemployment, crime, housing blight, and poor educational outcomes that affect that area. For reasonable accommodations, alternative formats, or to add content please contact Jennifer Melin at Jennifer.Melin@minneapolismn.gov or by phone: 612-597-3406. People who are deaf or hard of hearing can use a relay service to call 311 at 612-673-3000. Para asistencia 612-673-2700, Yog xav tau kev pab, hu 612-673-2800, Hadii aad Caawimaad u baahantahay 612-673-3500.